Without lock device, but with safety brake device except 2meter tapes to control speed of drawing back the tape. With hand strap, but without belt clip. OSTOP CONVEX without belt clip is individually boxed or blister carded for choice, but hand strap is fitted with the case. 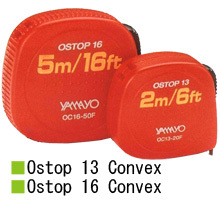 OSTOP CONVEX with belt clip is blister carded, but hand strap is not fitted with the case.